The Energy Dept. has been met with broad opposition from communities targeted for a borehole “test site” to study the theory of deep disposal of certain radioactive wastes. If a demonstration confirms the theoretical basis for the concept, waste could be placed “in the bottom mile” of a 3-mile-deep hole, under a “plug” of as-yet-undetermined material. Competing designs of potential “plugs” are among dozens of unresolved borehole questions. Since early 2016, the Department of Energy (DOE) has been looking for a site for a Deep Borehole Field Test for radioactive waste. Over a period of nine months, proposals were rejected in half of the targeted locations due to public opposition, so in December the DOE wrote a new contract to make people believe that there would be no radioactive waste in their future. The DOE revised its request for proposals to appear more “consent-based.” Four contractors were chosen to help this proposal gain public acceptance in four locations. At all four sites there has been public outcry, but in Quay County, New Mexico the resistance was so strong that the County Commission rescinded its previous approval. The three remaining sites are Otero County, New Mexico; Haakon County, South Dakota; and Pecos County, Texas. The first test borehole will be eight inches wide and three miles deep, with mock “waste” to be placed only in the bottom mile. Borehole disposal is being considered for compact packages of radioactive waste that have no potential for reuse, such as cesium and strontium capsules from Hanford, Washington’s nuclear weapons production; untreated calcine high-level radioactive waste currently stored at the Idaho National Laboratory (IDL); salt wastes from electro-metallurgical treatment of sodium-bonded fuels; and some DOE-managed waste reactor fuel currently stored in cooling pools at IDL and at the Savannah River Site in South Carolina. Other forms of rad waste have not been ruled out for borehole disposal, including deadly used reactor fuel. Boreholes are promoted by the DOE and the contractors that could profit from their development. Since the radioactive waste would be two miles below the surface, borehole proponents claim it is too far from the overlying rocks to affect the water table or surface environment, and it won’t be affected by the climate or human activities. Contractors promise between five and 20 local jobs in the test period alone. Before the plan was rejected in Quay County, New Mexico, project representatives hoped some $30 to $40 million would come into the county. They said that a borehole study gives local schools a unique learning experience in science and technology. 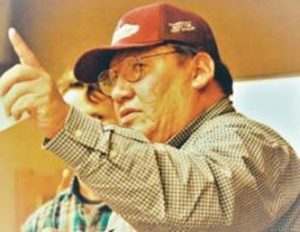 Reno Red Cloud, Natural Resources Regulatory Agency Director of the Oglala Sioux Tribe in South Dakota, addresses a Rapid City, South Dakota mining firm. The Haakon County, South Dakota borehole proposal is located in unceded 1851 and 1868 Ft. Laramie Treaty territory, between the Oglala, Rosebud, and the Cheyenne River Sioux tribes’ reservations—all of which are nuclear-free zones. Photo by Tatyana Novikova, Native Sun News Today. A panel of experts that joined the DOE in presenting to the US Nuclear Waste Technical Review Board (NWTRB) in December 2015 expressed concerns about the complexities of the structural and scientific properties of the Earth at the level the waste would be placed. “Surprises should be expected,” the panel said. 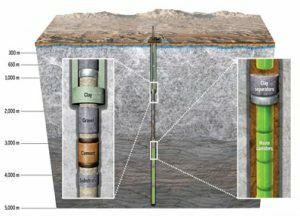 Surprises found in previous deep borehole drilling included active water flows, tectonic stress, irregular permeability, and microbial activity which can corrode steel casings and degrade seals on canisters. The NWTRB complained, “It does not appear that the DOE sufficiently considered how one might recover from an accident involving a waste emplacement package stuck in the borehole… It is not clear whether a stuck [and] leaking waste package could be retrieved during operations, as DOE assumes, or whether such waste package would be left in place.” This was the concern in Sweden when its deep borehole research was halted. Borehole disposal is the renewal of a once-abandoned scheme developed by the DOE for its mounting problem of radioactive waste. With three remaining potential borehole test sites, the agency may be able to move to the next phase of permitting and draft some work plans. However, the DOE has yet to verify boreholes’ clear advantages over other radioactive waste disposal possibilities, or to guarantee that testing sites won’t become permanent dumps. —Exchange Monitor, Feb. 17; Native Sun News Today, Feb. 15, 2017; Alamogordo Daily News, Feb. 10, 2017 & May 27, 2016; US Nuclear Waste Technical Review Board, June 9, Jan. 2016 & Oct. 21, 2015; Albuquerque Journal, Nov. 4, 2013; Blue Ribbon Commission on America’s Nuclear Future, January 2012.